When someone mentions the West and a great American vacation, the Grand Canyon, Yosemite and even California's Gold Coast might come to your mind. Whether you're going on a summer vacation or a long-weekend getaway in the fall, your time in the West is sure to be memorable. From the hottest, lowest, driest and certainly the most beautiful places in the West, the Travel Channel counts down the "Top 10 Wonders of the West." Death Valley is a land of harsh extremes, but it wasn't always that way. 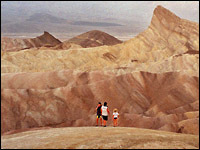 Now the ultimate desert landscape, Death Valley was once the bottom of a sea on the earth's equator. Today, the only moisture you'll find in this desert is your perspiration. Death Valley hits an average high temperature of 120 degrees in the summer, and it is the lowest and driest spot in the world. The valley temperatures are nothing to play around. According to park rangers, approximately three people die there every year from exposure. But try not to let these statistics discourage you from visiting Death Valley. Millions come year-round to soak in the sun, have an organized hike and take in the beauty of this vast, open landscape. 9. 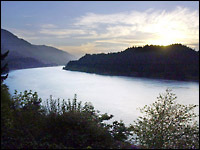 Columbia River Gorge, Ore.
East of Portland, Ore., flows the Columbia River Gorge. In 1916, the first highway ever built in the United States was constructed along the cliffs of the Columbia River, no doubt so that travelers could take in the beautiful views. The Columbia River region has one of the highest concentrations of waterfalls in the United States. It's home to the second-highest year-round flowing waterfall in the United States, Multnomah Falls, which stands an eye-popping 620 feet high. It's no wonder that nearly 2 million visitors come each year. Take a first glance at Arches National Park and you would think several sculptors got together and created something absolutely breathtaking. Not so - in fact, centuries of wind and water have sculpted the Utah sandstone into over 2,000 natural arches. You won't find more arches in one place anywhere else in the world. Aside from the obvious reason 1.5 million visitors come to the Arches National Park each year, the park also brings in the adventurous traveler. Case in point: extreme mountain biking was born at Arches. "Slick Rock Trail" is 9 miles of heart-pounding adventure, a trail etched out of slippery sandstone that can be deadly for the inexperienced cyclist. Arches National Park lies right in the middle of a desolate, treacherous and demanding landscape. Temperatures can easily each into the hundreds, making an afternoon walk or ride feel like a trip into a preheated oven. Under New Mexico's Guadalupe Mountains, roughly 750 feet down, exists a maze of tunnels that is the state's No. 1 tourist destination. Visitors venture into the damp and dark just for a glimpse of another world and its inhabitants. Of the 300 known caves in the Guadalupe Mountains, 120 of them are in Carlsbad National Park. Created by 500,000 years of dripping water, the caverns consist of 30 miles of vaulted halls and maze-like passages adorned with dazzling formations and colors of iridescent pinks, beiges and tans. The largest cavern, the "Big Room," is a colossal chamber that could fit six football fields and reaches as high as a 30-story skyscraper. Aside from the grandeur of the cave, visitors also come to see the residents of the caverns ... bats. For 5,000 years, the Mexican freetailed bats have come soaring out of the cave each evening in search of night flying insects. If all the walking and hiking of the 75 stories of cavernous cave makes you hungry, an elevator will carry you from the cavern floor to the outside world in 58 seconds flat. However, if you desire to stay below ground a bit longer, the Carlsbad Caverns lunchroom is sure to satisfy your appetite. 6. Channel Islands National Park, outside Los Angeles, Calif. Ever wanted to see an example of nature at its best - specifically, the sun basking on the beautiful islands of the Pacific? You don't have to travel far. Only accessible by boat, the Channel Islands are located 90 miles off the coast of Los Angeles. Consisting of 177 miles of coastline, these five islands; often referred to as "America's Galapagos;" are decorated with rocky cliffs, arches and beaches populated by 2,000 plants and animals, including sea lions and pelicans. One hundred and fifty of the animals found on the islands are found in no other place in the world. Channel Islands National Park is considered one of the top destinations for scuba divers; its waters are also home to 17 different species of sharks, including the great white. But that threat doesn't stop the divers, who come from all over the world. Since its last eruption 250 years ago, this beautiful, dormant volcano has been a paradise for hikers and skiers. 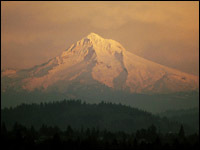 A great combination of beauty and danger, Mount Hood is the second-most climbed peak in the world. During climbing season, you can expect roughly 200 people a day. These include skiers and snow boarders, who can take advantage of many of the mountain's slopes until the Fourth of July. With so many people climbing, skiing and playing in the park's 189,000 acres each year, it's important for everyone to be careful. The unique landscape of Mount Hood is especially treacherous. On the face of a glacier, it pays to be very careful. If you visit this area, use good judgment and proper equipment. After a long hike or a day of skiing, make sure to visit the historic Timberline Lodge to rest and warm up. Constructed in 15 months and built in the height of the Great Depression, this lodge displays the handiwork of over 300 craftsmen. 4. Redwoods National Park, Calif.
As the oldest trees on Earth, the redwoods of Northern California the oldest living things on Earth, the redwood trees of northern California are the main attraction at this national park. What's most unique about this attraction is that you can experience two natural wonders in one place - the forest and the ocean. 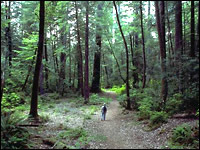 Roughly 300,000 visitors come to Redwoods National Park each year to experience the grandeur of these giant trees. Coastal fog and cool, moist air keeps the trees damp, a perfect condition for their growth. The trees measure from 8 to 20 feet around and can grow as tall as a 35-story building. They live an average of 600 years, but some of the trees have been known to reach the ripe old age of 2,200 years old! Nestled within the Sierra Nevada Mountains, Yosemite National Park greats nearly 4 million visitors each year. A glacier-carved canyon, Yosemite was the first territory in the United States set aside for public use. Filled with meadows, cliffs, waterfalls and forests, the park is also home to the fifth tallest waterfall in the world. With such beautiful attractions awaiting them, it's no wonder visitors come to the park year after year. The best way to see Yosemite is on foot, as the park has over 800 miles of trails. However, this hike is not for the faint of heart. Yosemite ranges from 2,000 feet - about sea level - to 13,000 feet! The park's most famous attraction is Half Dome. Carved from granite by glaciers and millions of years of erosion, it stands 4,000 feet above the valley. Visitors can see Half Dome from Glacier Point, or they can hike to its peak in one day. Yosemite's second lookout, El Capitan, fondly known as "El Cap," is officially the largest monolith of granite in the world. As the first national park of the United States, Yellowstone covers over 2.2 million acres of the American West, filling it with spectacular mountain scenery, animals and endless natural beauty. But did you know that this park also lies on top of one of the most dangerous volcanoes in the United States? In researching the geological history of the park, scientists have recorded three major eruptions more powerful than any in the world's recorded history, and they all happened at Yellowstone. The eruptions toppled a mountain range and left a crater the size of the Los Angeles basin. Moreover, the volcano that sits underneath this beauty is still alive. But that little detail doesn't stop nearly 2 million visitors from coming to the park each year. The main attraction at Yellowstone is none other than Old Faithful. As a result of the volcanic eruptions, 10,000 geysers and hot springs were formed and almost all of them are in Yellowstone; the most famous of these is Old Faithful. Reaching between 106 and 180 feet high, this fountain of steaming water erupts on a regular basis, expelling roughly 8,400 gallons of boiling, hot water. Old Faithful is one of the main attractions at the park, but it certainly is not the only one. Herds of buffalo and elk roam freely in Yellowstone. Visitors also spot the occasional grizzly bear. Just as in any national park, there are safety rules to follow: hike with a group, never go near a bear and her cubs, and most importantly stay away from bear dens (caves). 1. The Grand Canyon, Ariz. The Grand Canyon can stun anyone into complete silence. This natural wonder is so incredibly large, it's hard to believe a place of such enormity exists - even once you've seen it. The Colorado River started its work over 20 million years ago. The result, so far, is a 1-mile-deep, 10-miles-wide from rim to rim, and over 1 million-acres-long canyon. A magnificent example of erosion, the Grand Canyon was formed by water cutting through layers of rock for millions of years. The canyon's geological history is so long and complicated that geologists and Earth scientists still don't fully understand it. One of the best spots to hike is along the rim. For more adventurous travelers, the Colorado River offers some rip-roaring whitewater rapids. 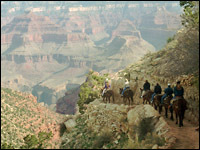 In any event, visitors should be aware of the apparent dangers when exploring as there are no railings and protective barriers along the entire canyon. In many places, you can simply walk out and have a 400- to 600-foot drop below you. People who have climbed the Alps and hiked in the Appalachians will find the environment of the Grand Canyon to be quite different, and they should treat it as such.